Welcome to A10 Talk’s Preseason Top 25 Player Countdown for the 2017-18 season. Each day, we’ll be publishing a new article, counting down our best 25 players for the coming season. 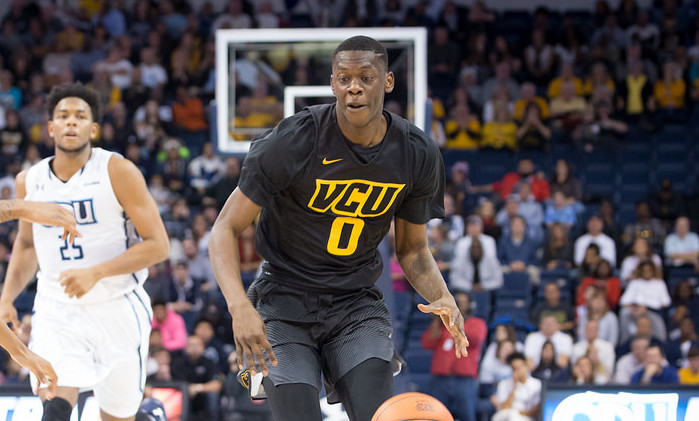 Today, we feature #20 De’Riante Jenkins of VCU. Jenkins arrived at VCU with much hype, checking in as a top-50 recruit for the 2017 class (59th in ESPN’s top-100, 37th by 247Sports.com and a national composite ranking of 45th in the country). After showing plenty of freshman flash during VCU’s non-conference schedule, the 6’5 wing went down in the first game of A-10 play, thus keeping one of the A-10’s most promising players off the casual radar of the league. Jenkins averaged just 4.3 points per contest in 12.3 minutes of action as a freshman in the 20 games he appeared in, but finished strong with a career-high 15-point performance in VCU’s A-10 quarterfinal defeat of George Mason, hitting all three of his three-point attempts in that contest. Percentage wise Jenkins was one of the best in the conference, hitting 45.5% of his threes and 54.5% of his attempts inside the arc. Jenkins’ 113.2 offensive rating was second to only Justin Tillman on last year’s team while his 61.8% true shooting percentage bested all of VCU’s key contributors including the likes of JeQuan Lewis, Mo Alie-Cox and the ultra-efficient Tillman. And that’s what takes us into part II of this article and why Jenkins is such an obvious breakout candidate in next year’s A-10. Jenkins saw limited minutes due to injury and coaches decision, but let’s consider what he did in limited minutes. Jenkins played 20 or more minutes just six times this past season, averaging 10.3 points and 4 rebounds during 23 minutes per contest during that stretch (reminder: as a freshman). His 45.5% three-point percentage was tops in the conference while his 61.8% true shooting percentage was better than the entire A-10 First Team from last season. Combining a healthy Jenkins with a Mike Rhoades fast-pace three-point heavy system — not to mention the graduation of a ton of VCU talent, meaning a huge opportunity for playing time — and you have the perfect storm for a Jenkins explosion the 2017-18 season. Simply put, Jenkins has NBA potential. One of the few in the Atlantic 10 conference that can truly make that claim. While I suppose it’s fair he enters this ranking as No.20 due to last season’s limited sample, I suspect come March we’ll be wondering how he was ever ranked this low.